Several Palestinian commercial buildings, power lines, and agricultural crops have been demolished by Israeli bulldozers in different areas of the Occupied Jerusalem and West Bank over the past 24 hours. 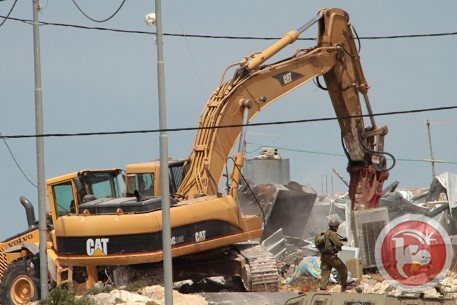 PIC correspondent quoted local sources as stating that arbitrary demolitions of a series of commercial buildings, carpentry and other shops, were carried out by the Israeli Occupation Forces (IOF) on Tuesday morning after having encircled a neighborhood north-west of Occupied Jerusalem and blocked its entrance and exit gates. Other to-be-demolished buildings are being evacuated by Israeli soldiers. In a related context, IOF ruined the power network in Idna town, west of al-Khalil, following bulldozing procedures and brusque invasions on Monday. Local sources said IOF took off power poles, causing serious damage to around 500 meters-long electricity lines. 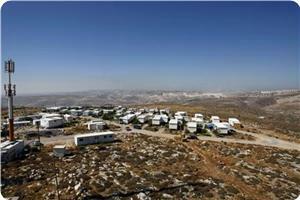 Israeli soldiers also broke into nearby Wadi Risha and rummaged through Palestinians’ native homes. Military checkpoints were randomly set up while vehicles and IDs were meticulously inspected, eye-witnesses told PIC. 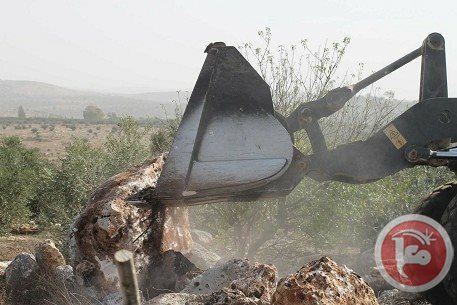 In a similar incident, Israeli vehicles bulldozed large areas of Nahalin village, all planted with perennial trees, west of Bethlehem, on Monday morning. 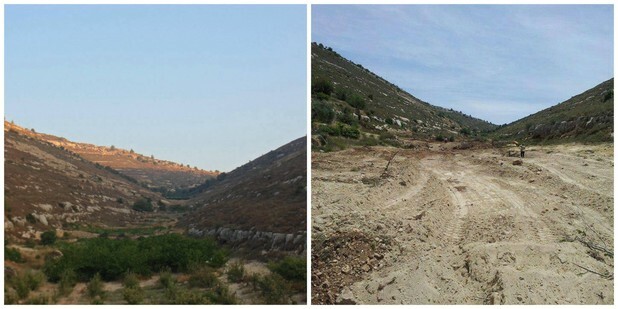 Majid Ghyadha, member of Nahalin Village Council, said in a press release that Israeli bulldozers messed up the naturally idiosyncratic character of several acres of Wadi Salem lands. Dozens of olive, almond, and grape trees, all perennials, were entirely knocked down throughout. IOF, heavily deployed in the area, have been denying landowners access into their lands, Ghyadha added, warning of anticipated plans to construct a road linking between the nearby illegal Daniel and Beitar Illit settlements. The upsurge of Israeli attacks on Palestinian citizens and property in the village has been on the rise and made obvious through frequent pumping of water-wastes over Palestinians plants, razing procedures, and illegal land confiscation. Meanwhile, a series of random combing operations were performed by IOF soldiers at the main entrance to the Fawar refugee camp, south of al-Khalil, on Monday night. According to eye-witnesses, flare bombs were fired by an Israeli infantry unit that has stationed in the area and denied Palestinian citizens access out of or into the camp, with no legitimate reasons. Israeli soldiers demolished on Monday, May 19, 2014, nine buildings in occupied Jerusalem, displacing families, and causing significant losses. The destruction took place in al-Ezariyya and a number of Bedouin communities. 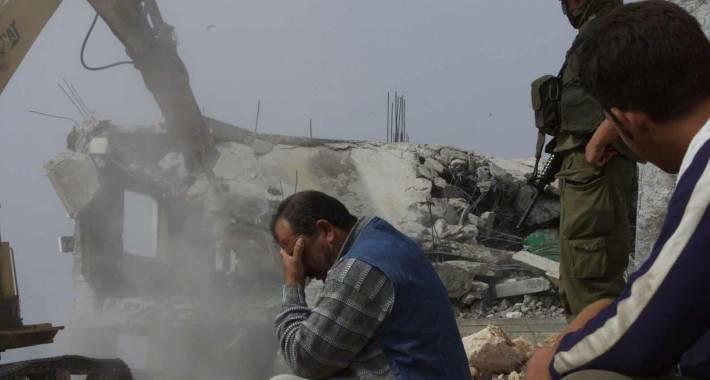 Palestinian sources said the army demolished, on Monday evening, a Palestinian home, sheds, and a barn belonging to a resident, identified as Mohammad Ibrahim al-Jahhalin, in Jabal al-Baba area, in the al-Ezariyya town east of occupied Jerusalem. Soldiers also demolished a home belonging to resident Mahmoud, Mohammad’s brother, in the same area. The destruction of his property is the second since last month. Israeli soldiers frequently demolish residencies, sheds and structures belonging to Palestinian residents, in occupied Jerusalem, and in various Palestinian Bedouin communities near Jerusalem, the Jordan Valley and different parts of the occupied West Bank. 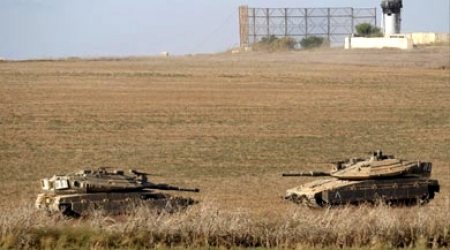 A Palestinian man was shot and injured by Israeli forces in northern Gaza, on Monday, in the second incident of its kind in 24 hours, according to locals. In the West Bank, east of Jerusalem, a number of Palestinian-owned structures were demolished by the Israeli military, leaving 15 people homeless. Witnesses told Ma'an News Agency that a 20-year-old man was collecting stones to make concrete outside of Beit Hanoun, near Erez crossing, when Israeli forces shot him. The young man, who was not immediately identified, sustained moderate wounds, Ma'an reports. A spokeswoman from the Israeli army said that "dozens" of Palestinians gathered in an area near the border which they were "not permitted" to enter. She stated that they were warned to distance themselves, upon which warning shots were fired into the air. Soldiers then fired at the lower extremities of one, the spokeswoman said, identifying a hit. Just Sunday, in the same area, a 21-year-old gravel worker was also shot by Israeli forces. The man was taken to Kamal Adwan Hospital in moderate condition. Ma'an further reports that many people in the besieged coastal enclave collect small stones in order to make gravel for concrete, because the import of concrete is forbidden by the Israeli economic blockade, which has been in place since 2006. 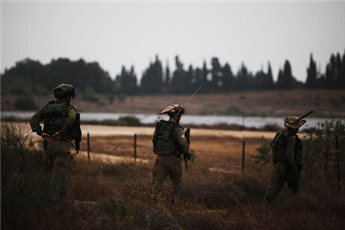 Israeli soldiers frequently fire on farmers and other civilians inside the Strip, if they get too close to certain areas of land near the border which the Israeli military has closed off to Palestinians. According to Israeli human rights organization B'Tselem, the number of live-fire casualties near the fence has been on the rise since last December. Also on Monday, in al-Eizariya and the E1 area east of Jerusalem, Israeli bulldozers razed Palestinian structures and left 15 people homeless, according to a local official. Secretary-general of the Bedouin Jahalin tribes, Sami Abu Ghaliya, said that Israeli authorities destroyed two small residential structures and four of agricultural nature belonging to his family at the entrance of the village. 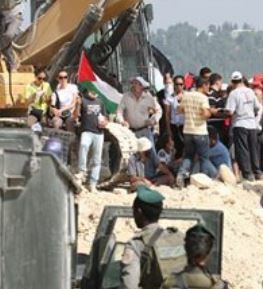 Additionally, two structures used to house cattle were destroyed by Israeli bulldozers, in the al-Kasarat area in E1. In nearby Jabal al-Baba, Ma'an reports that a tent belonging to Mahmoud Ibrahim Jahalin was destroyed, along with two animal sheds, according to Abu Ghaliya. The tent was a donation to Jahalin following the demolition of his home at the beginning of April. 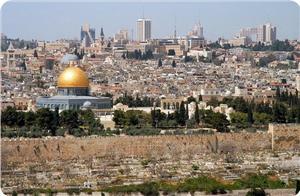 Israel rarely allows Palestinians to build in the West Bank, including East Jerusalem. They are responsible for the demolition of at least 27,000 Palestinian homes and structures since first occupying the West Bank in 1967, according to the Israeli Committee Against House Demolitions. The ongoing demolitions in the area between the Naqab (Negev) and Jerusalem show that the Prawer Plan is still in full force, even if not under official implementation; the effects for Palestinians in the area are the same. The latest demolition came just yesterday, as Israeli bulldozers demolished several structures in the bedouin village of Wadi al-Neam, the Palestinian News Network (PNN) reports. Wadi al-Neam is not recognized by the state of Israel. It does not acknowledge its existence, and therefore it is considered illegal. Israel does not distinguish between the 48 and 67 territories, when sending out teams of bulldozers for demolitions and expulsion of residents, regardless of documented Israeli citizenship among them or lack thereof. Eyewitnesses told a PNN correspondent that these demolition orders are illegal under human rights standards as well as international law. These processes were added by Israel to subtly implement policies outlined in the Prawer plan, which was stopped a few months ago and aims to seize Palestinian lands and deport the indigenous population of the Naqab. 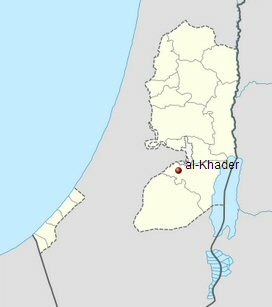 The PNN correspondent added that Wadi al-Neam is located to the south of Beersheba, where the Israeli authorities only recently built a chemical factory and a military base. Adalah, the legal center for Arab minority rights, said the Israeli municipal council in the holy city intends to appropriate more than 700 dunums of Palestinian-owned land in east Jerusalem. Adalah stated on Sunday that the Israeli district planning and construction committee in (occupied) Jerusalem gave approval for a plan to build a Jewish national park on a large tract of Palestinian land in Issawiya and At-Tur districts to the east of the city. The legal center noted that the land seized for this project is located in a Palestinian territory under Israel's occupation since 1967. The center asserted that the plan, if implemented, would violate the international humanitarian law, which prohibits Israel from making changes to territories under its occupation. For its part, the Arab center for alternative planning said this Israeli project would prevent any possibility for the future development of Issawiya district, whose population numbers about 15,000 Palestinian citizens, and At-Tur district, which is populated by 26,000 citizens. It warned that this intended plan would interrupt the territorial contiguity between Palestinian neighborhoods and others areas. 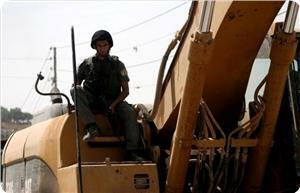 Israeli bulldozers on Sunday demolished a house in a Bedouin village in the Negev desert, witnesses said. Locals told Ma'an that Israeli bulldozers demolished the house in the unrecognized village of Wadi al-Niam under the pretext that it was built without a license. The demolition left a woman and five children homeless, the head of of Wadi al-Niam's village council said. "These children are like orphans -- their mom is raising them alone because their father is in jail," Labbad Abu Afasha told Ma'an. "They demolished the house leaving the children in the open." Talab Abu Arar, a Palestinian member of the Israeli Knesset, described the demolition as "utmost oppression and arrogance." Abu Arar said he would "support this afflicted family against this coward racism." Wadi al-Niam is one of dozens of Bedouin villages in Negev which is unrecognized by Israeli authorities. Some communities are subject to frequent demolitions by authorities. The proposed Prawer Plan -- which would have forcibly removed tens of thousands of Bedouin from their homes in order to make room for Jewish towns in the region -- was taken off the agenda late last year following widespread protests. Dozens of Israeli soldiers invaded Khirbit at-Tawil village, near Aqraba village, south of the northern West Bank city of Nablus, and confiscated tents displacing the residents for the third time. Ghassan Daghlas, in charge of Israeli settlements file at the Palestinian Authority in the northern part of the West Bank, stated that several military jeeps invaded the village, removed and confiscated three tents sheltering Palestinian families. Daghlas added that this is the third time in less than a month that the army invades the village, and confiscates tents. Destruction of homes and property is an act of collective punishment that violates International Law, the Fourth Geneva Convention, and all related international human rights agreements. Israel is responsible for the destruction of dozens of thousands of homes and property in different parts of the occupied West Bank, the Gaza Strip and East Jerusalem. 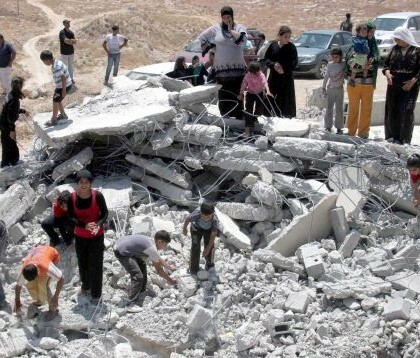 The Israeli Committee Against House Demolitions (ICAHD) previously reported that Israel has demolished about 27,000 Palestinian homes and other structures since 1967. It also said that the exact number cannot be precisely determined, especially when taking into consideration that the Israeli Authorities only report the “demolition of structures”. The occupation municipality’s bulldozers demolished on Wednesday a residential home for Amin Mohammad Shkeirat in the neighbourhood of “Khallet Abed” in Jabal Al-Mukabber in Jerusalem. Amin’s mother said that the demolition operation was executed without prior notice and noted that nobody was home at the time of demolition and removal of furniture, and the family received a phone call from the neighbours to inform them of the demolition. She also explained that the forces broke into the house and carried out the demolition before the neighbours and family were able to remove all the furniture as the municipality’s crews only removed parts of it. She added that she built the 140-square meter house two years ago and that it consists of two rooms, a living room and their facilities; note that the municipality demolished two rooms and their facilities nearly three years ago. 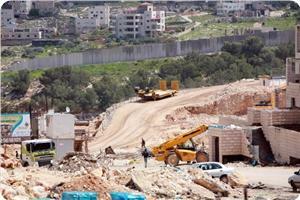 Israeli bulldozers demolished three Palestinian structures in East Jerusalem early Wednesday, locals told Ma'an. Accompanied by Israeli forces and police officers, bulldozers entered the Palestinian neighborhoods of Beit Hanina, Shuafat, and Ras al-Amoud, where they destroyed two shops and a workshop. In the al-Ashqariyya neighborhood of Beit Hanina, bulldozers demolished a store belonging to Mousa al-Natsha. The store measured 55 square meters and was built in 2011, al-Natsha told Ma'an. Meanwhile, Israeli authorities demolished another store on al-Khansa street in the Shuafat neighborhood. The store's owner, Muhammad Awadallah, told Ma'an the store measured 18 square meters and that its walls were built 80 years ago. Its tin roof was added in 2011, Awadallah said. He said Jerusalem municipality workers had issued demolition orders "several times," but that he had paid a total of 20,000 shekels in fines to postpone the demolition. Additionally, bulldozers in Ras al-Amoud demolished a steel structure owned by Sufyan Jabir. Jabir said he used the building as a metal workshop. Built 14 years ago, the structure measured about 100 square meters.